Baby James Yap Jr. has just become the youngest person in the country's political arena to produce a one-liner so amusingly out of sync that presidential rivals Manny Villar and Noynoy Aquino may even share a laugh about it later. Election day is still weeks away but the competition for mass support among political candidates is getting more and more rigorous. Posters and streamers clutter the streets, roving vehicles' loudspeakers persistently belt out loops of campaign jingles on a daily basis. Presidential candidates have been hopping from one province to another, mounting political rallies. Sen. Benigno "Noynoy" Aquino III and his Liberal Party trooped to Bacolod City last March 29. His youngest sister Kris Aquino tagged along with her son Baby James Yap, who has been joining his tito's provincial tours. During that event, the two-year-old son of the host-actress did something quite unexpected. Holding the microphone, Baby James greeted the crowd, "Hallow!" "Hello!" a thousand people answered back. Waving the mic to and fro, the child smiled and exclaimed, "Veeyar!" Kris looked surprised at her son's utterance. Then softly and with a quiet laugh, she said, "Nooo... O, you go na." Baby James smiled from ear to ear. He had no idea of the impact he just made. Let's just say the toddler was simply quick to absorb what he hears from the people around him, including the personalities on television and perhaps even on radio. AMUSED REACTIONS. Baby James' one-liner elicited hearty laughs and a round of applause from the Bacolod crowd. Up north in Bangui, Ilocos Norte, Manny Villar in a press conference was told about the free promotion by his rival's nephew. "Ako ay natutuwa at isang malaking karangalan sa akin dahil alam mo ang mga bata, pinaka-honest," he told GMANews.tv. And according to the feed received by PEP (Philippine Entertainment Portal), the former senate president will be sending Baby James a Technomarine watch for kids, with yellow, green, and orange bracelet for the latter's "free endorsement." Kris Aquino, in a separate interview, revealed that Baby James has this habit of teasing his uncle by saying the names of Noynoy Aquino's political rivals. In her Twitter account, Kris also apologized to Noynoy and to her sisters. 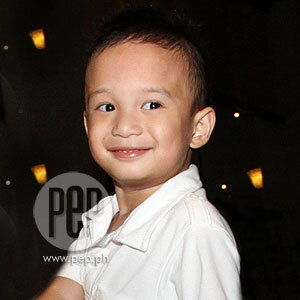 “Nag-sorry ako to Noy & my sisters right away & they told me siempre he's 2 yrs old–terrible 2s. Moral of the story–we let him be 2 while guiding him to be a good boy,” Kris Twitted last Monday, April 5. CLICK HERE to watch the clip of Baby James.